(c) HBO, Game of Thrones promotional still. 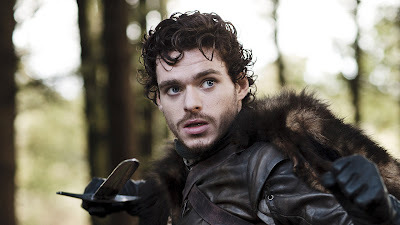 So many of us had tantrums last week when Game of Thrones killed off the young, idealistic scion of the Stark family, Robb Stark. He was good, noble, fair of bearing . . . and young, so young. I was one of many swearing off the HBO show, such a betrayal it was, an oath that lasted a full six days until the next episode aired. The tragicness of Robb's death, along with that of his young wife, their unborn child, and his mother, lingered for days after. I tried to undo it mentally, make it not have happened somehow or at least make it not so bad. But it was terrible and nothing else that happens in the show, no future act of vengeance or justice, will ever make it less terrible. After sitting with the episode for a few days, I realized I had felt exactly this way only one other time: when I read The Iliad several years ago. The Iliad starts at the tail end of a war. For ten years the Greeks have been laying siege to the city of Troy. The army of Troy's King Priam is led by his two sons: the noble Hector and the beautiful Paris, whose wooing of Helen, a Greek king's bride, set off the conflict. The Greek army is led by several kings and warriors, including the nearly indomitable Achilles, the closest thing to a war machine we've known until the advent of the bulletproof heroes of 1980s action movies. Hector is the hero of The Iliad because he is, as classicist Bernard Knox wrote in his introduction to the Fagles translation, a "complete man." He is a prince, a warrior, a son, a brother, a protector, a husband, and a father. Over the course of the long poem, we observe him function in each role, and through them he achieves the golden balance of nobility: He is a strong warrior, but not brutal like Achilles. He is a loving husband, but not romantically indulgent like Paris. He's a prince, but he acts as if the city is his responsibility, not his property. Even his heroic epithet, "breaker of horses," is a fine attribute: useful, militarily crucial, but not cruel or aggressive. "The Iliad is a terrifying poem. Achilles [. . .] is redeemed as a human being, but there is no consolation for the death of Hector. We are left with a sense of waste, which is not adequately balanced even by the greatness of the heroic figures and the action; the scale descends toward loss." Game of Thrones is not The Iliad. But it's kind of cool to realize that millions of viewers this past week were experiencing that very sense of tragedy that The Iliad offers from two millennia back.